Brighten someone’s special day with the stunning Vibrant Bouquet. 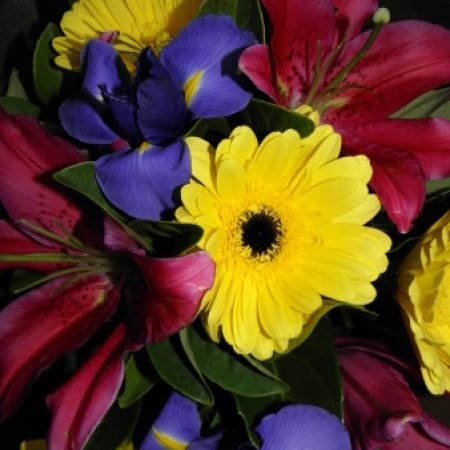 This vibrant combination of flowers will make an impression in any room. A high impact design in any office, home, hospital or function room. Filled with long lasting and fragrant oriental lilies, classic iris and the bright and happy gerbera surrounded by lush green foliage. Same day delivery available to all areas of Newcastle and Lake Macquarie, including John Hunter Hospital, Newcastle Private Hospital, Charlestown Square, Lake Macquarie Private Hospital, and Mater Hospital from Amaranthine Flowers By Design, New Lambton, Newcastle.